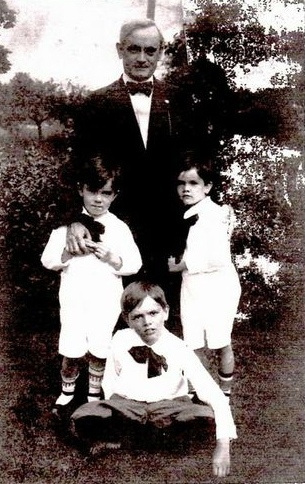 Zachary Taylor Davis and three of his sons. 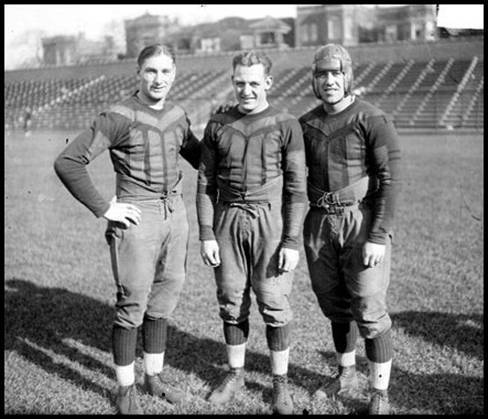 From left; David, Lawrence, and William. Tragically, William would not survive past age seven. His career began after he gra­dua­ted from the Ar­t Institute of Chicago and served a six year apprenticeship, which included working as a drafts­man for Adler and Sullivan. (Another young fellow named Frank Lloyd Wright was just about to leave due to a breach of contract.) 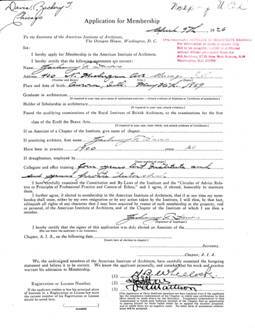 He then moved on to a position as architect in residence with Armour and Co. 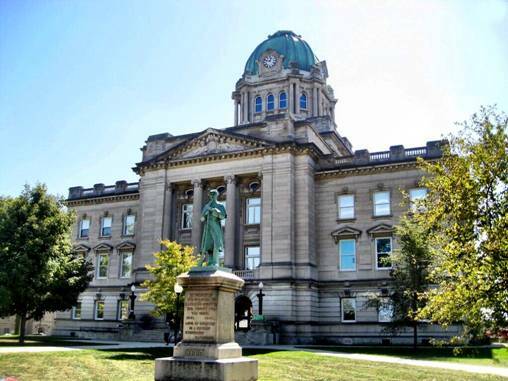 In 1909, he de­si­gned the Kankakee County cour­thouse. 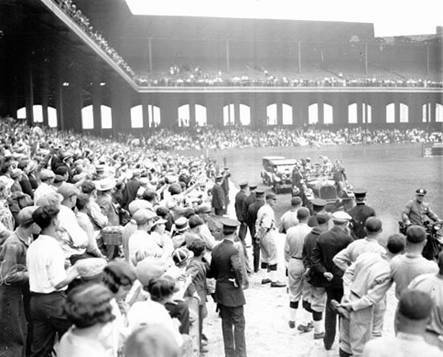 A year later, he was hired by Charles Comiskey to de­sign Co­mis­key Park for the Chicago White Sox. 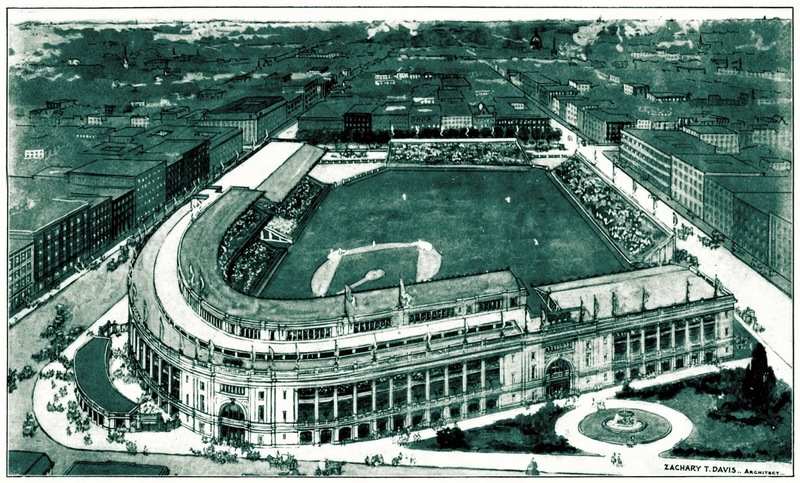 To pre­pare for the project, he tou­red ball­parks around the coun­try with White Sox pit­cher Ed Walsh. 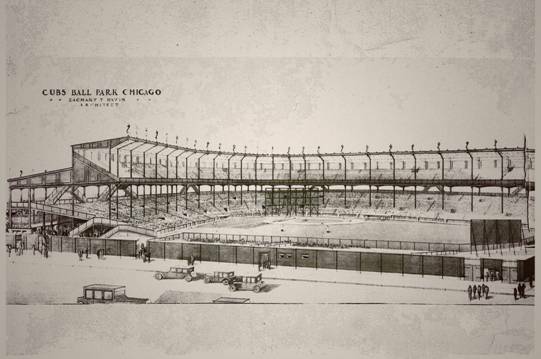 In 1914, he de­si­gned Weegh­man Park for the Chicago Whales, a park which would later be­come Wrigley Field. 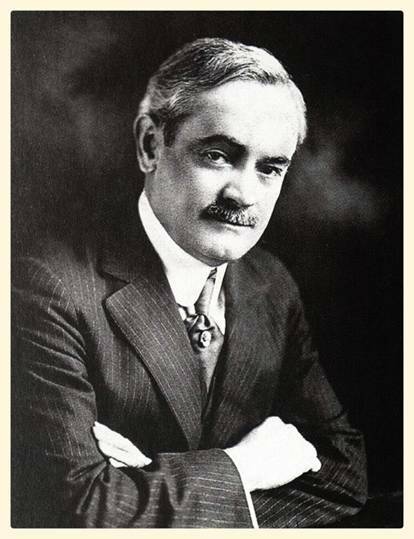 During the latter part of Zachary’s career (during the Great Depression - when work had dried up for most architects) he became Superintendent of Repairs on Schools for the Chicago Board of Education. 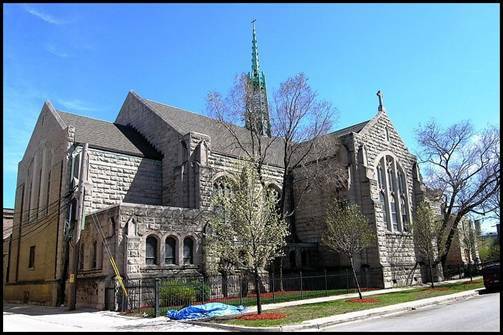 When he died at age 77 on December 16, 1946 (at his home in the once fashionable South Side neighborhood of Kenwood), services were held at the church he designed in 1904 - St. Ambrose. He would be interred at Mount Olivet Cemetery, joining his wife Alma, who predeceased him one month earlier. 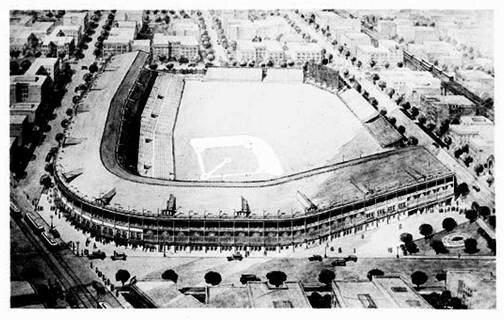 In 1922 Zachary would be called back by William Wrigley Jr. for an upper deck expansion. A Rendering of Wrigley Field in 1929. 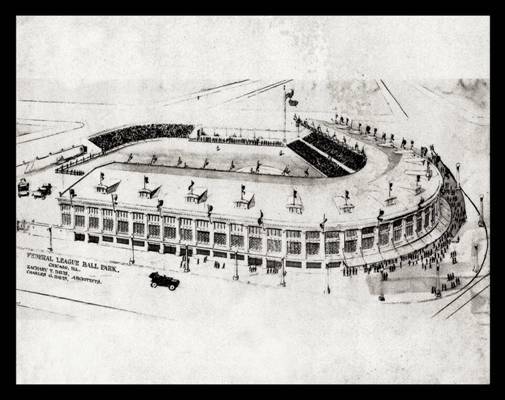 In 1924, with the Los Angeles Angels and their parent club, the Chicago Cubs under his ownership, William Wrigley Jr. requested that Zachary design a ballpark for him that had many of the characteristics of Wrigley Field in Chicago. 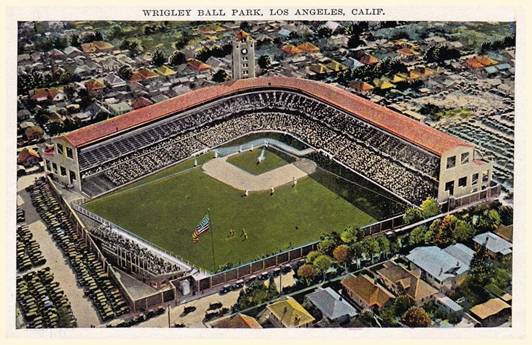 With a budget of $1,500,000, the ballpark quickly became known as Wrigley’s “Million Dollar Palace.” Unfortunately, Wrigley Field Los Angeles was demolished in 1965. 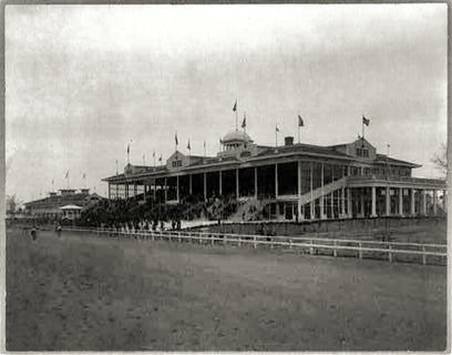 In 1904 Zachary designed the clubhouse for Oaklawn Park race track, and it officially opened on Feb. 24th, 1905. 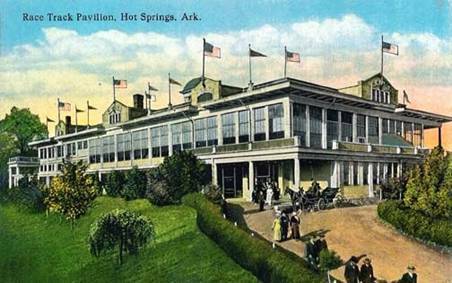 Oaklawn featured one of the first glass-enclosed and heated grandstands, and its popularity was immediate with Midwest horsemen. 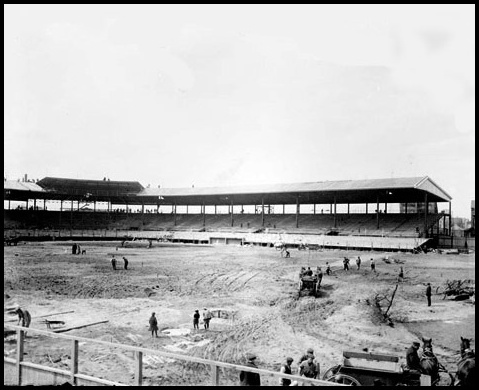 In late 1914 (the same year as the Weeghman/Wrigley Field construction) Zachary and his brother Charles G. Davis were contracted to design Speedway Park – to be completed by June 1st, 1915. 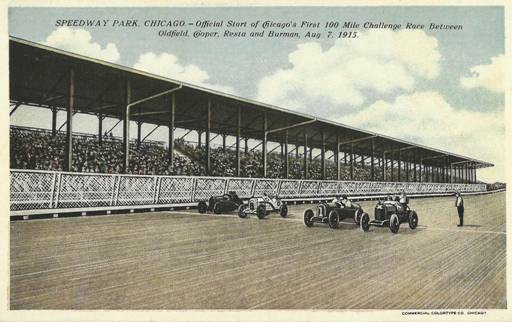 At the time, it was called the “fastest, safest and most spectacular automobile race course in America.” Speedway Park was a mammoth two-mile wooden board track located in Maywood, which operated between 1915 and 1918. 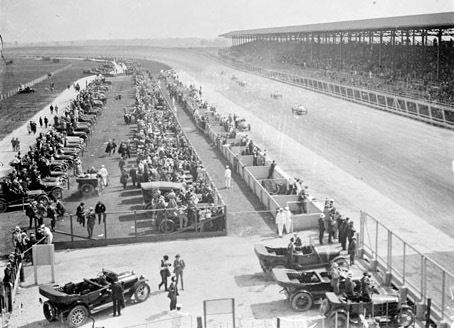 For a brief period, it made Chicago the capital of worldwide auto racing. The track was located on 320 acres of farmland just south of 12th Street between First and Ninth Avenues with 22nd Street being the grounds’ southern border. 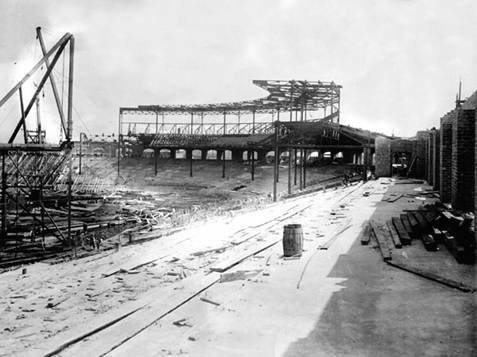 The amazing thing about the construction of the speedway is that it was completed in the course of about 60 days, using 14 million feet of lumber supplied by timber baron Edward Hines. 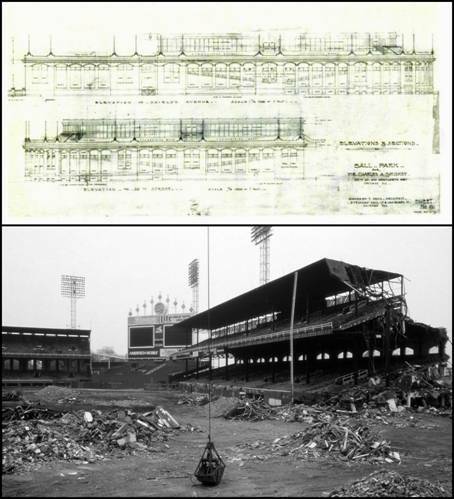 It included 100 carloads of sewer and drain tile, 15,000 concrete piers, 50,000 cubic yards of cement, 500 tons of nails and spikes, 1,000 tons of steel, 2,000 carloads of cinders and six miles of road approaching the park. 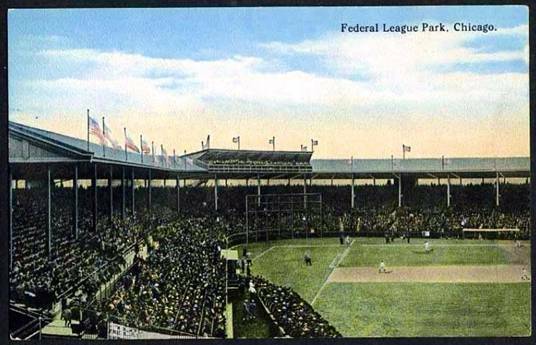 The park continued to operate during WWI, but after the summer 1918 season, due to financial mismanagement and bankruptcy, it never reopened. 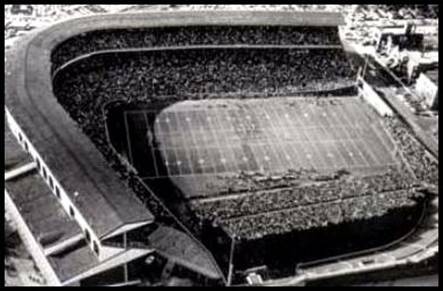 The track was dismantled, with the property being purchased and donated to the U.S. government by Edward Hines Sr. for a veterans hospital. It was called Public Health Service Hospital #76 for a time, but was later renamed the Edward Hines Jr. Memorial Hospital in October of 1921 in memory of Hines’ son, who died in France during WWI. 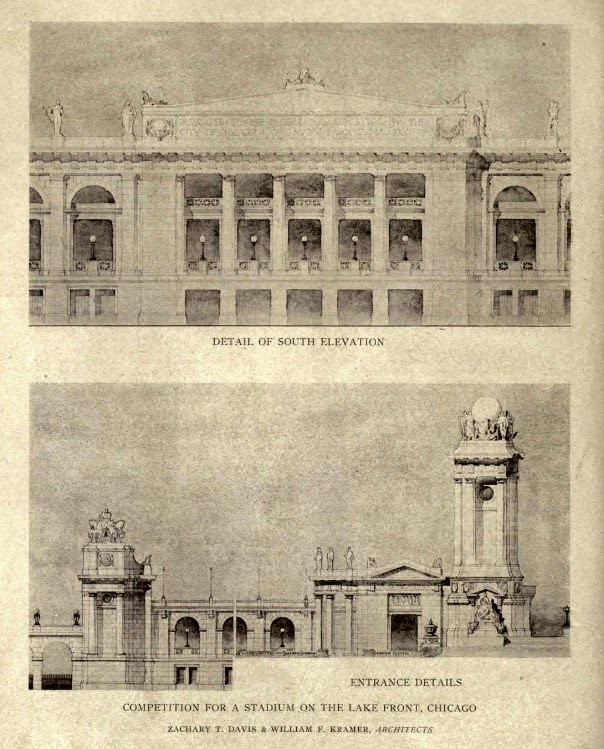 Not long after establishing his career as architect in residence for Armour & Co., Zachary became the “go to” architect for packing houses across the country. His plants incorporated the use of the most recent building materials and technology at the time. Shown above is the rendering for a packing house that was built for Schwarzschild & Sulzberger in 1898. 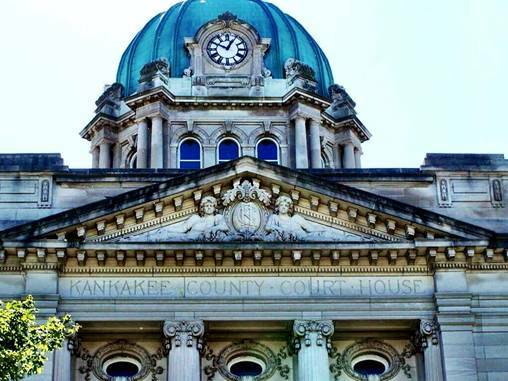 The Kankakee Courthouse was begun in October of 1909 and completed in July of 1912. It is a fine example of Beaux-Arts architecture, and in 2007 it was placed on the National Register of Historic Places. 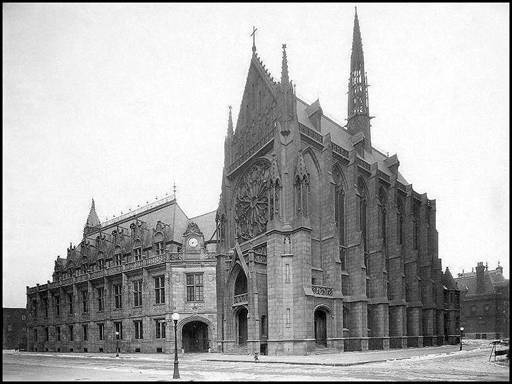 Saint Ambrose was built in 1904 at the intersection of S. Ellis and 47th street. Sadly, the steeple no longer remains; when St. Ambrose was renovated in 2006 it was removed. 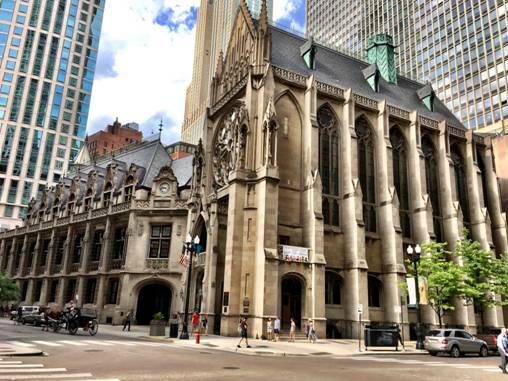 Although considered one of the most beautiful spires in the city, repairs were estimated to be 1.2 million and the archdiocese could not absorb the cost. The exquisite St. James Chapel at Archbishop Quigley Pre­pa­ra­tory Seminary (dedicated in 1918) as it appeared in 1925. 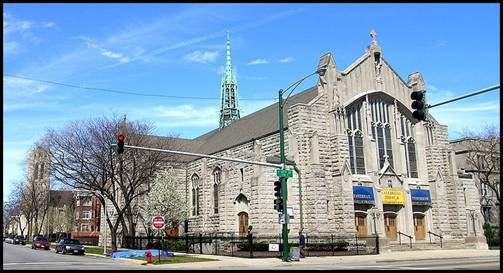 The Quigley Center and St. James Chapel today. Take note that only the base of the steeple remains. 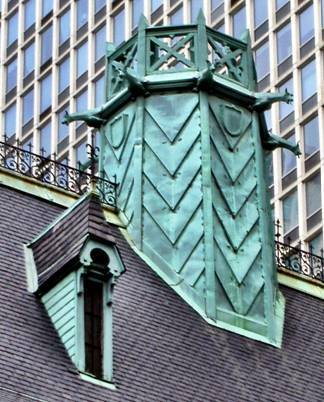 The original copper spire was damaged by a wind storm in 1941 and permanently removed. 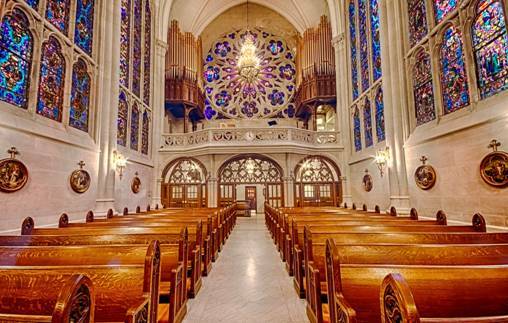 The magnificent interior of St. James Chapel - viewed from the alter toward the rose window on the west wall. 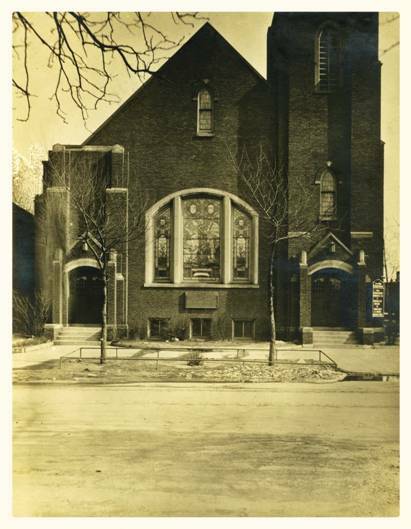 Construction began in November of 1920 on the Drexel Park Presbyterian Church on the northeast corner of Marshfield Ave. and Sixty-fourth Street. Zachary designed a brick edifice with stone trim and 500 seats, including a Sunday school in addition to the auditorium. 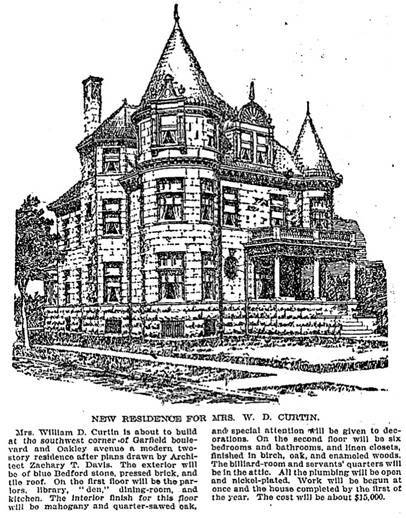 This house was designed during the summer of 1899 for Mrs. William D. Curtin at the corner of Garfield Boulevard and Oakley Avenue. The house is still extant as a residence. 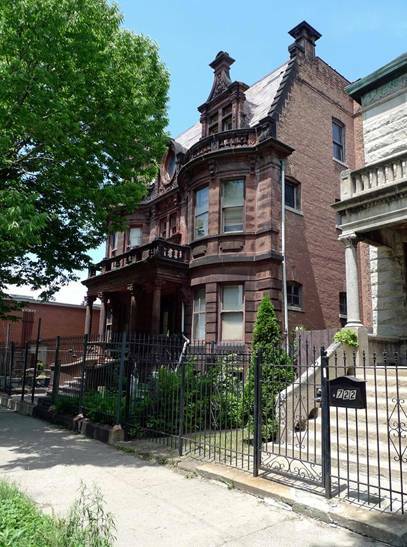 In 1901, this house was completed at 726 West Garfield Boulevard for the successful businessman/saloon owner James “Big Jim” O’Leary. O’Leary was only two years old when the Great Chicago Fire began in the family’s DeKoven St. barn. O’Leary would live at 726 Garfield until his death in 1925. The house is still privately owned. 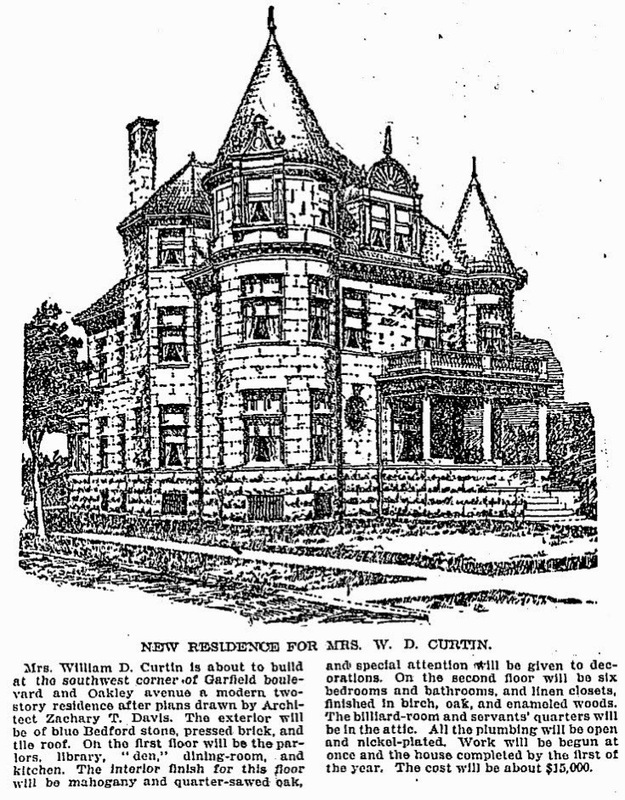 Residence for William Wrigley Jr. 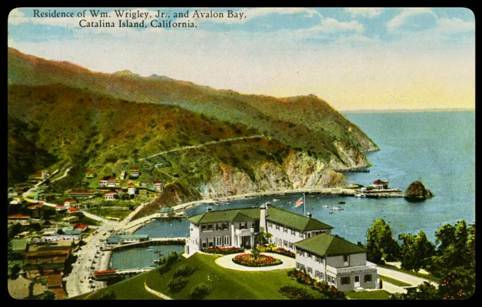 In 1919 William Wrigley Jr. purchased a controlling interest in Santa Catalina Island, off the coast of California. He immediately hired Zachary to design a home for him atop Mt. 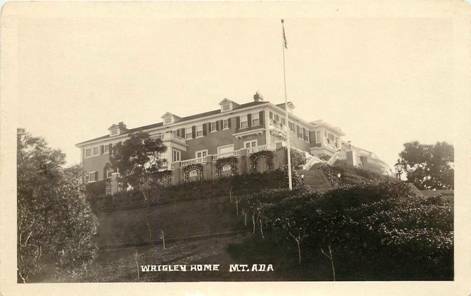 Ada (named for Wrigley’s wife) and the residence was completed in 1921 - the same year that the Cubs started using the island for their spring training. The Mt. 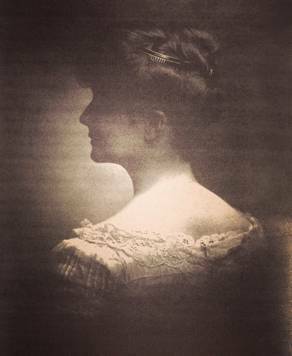 Ada “summer cottage” had a commanding view of the island. Zachary designed the “L” shaped mansion to wrap around a formal motor court entry on the mountain side, with a graceful grand staircase of over 100 stairs leading up to the house from the ocean side. The plan included three stories, a Turkish bath, billiard room, organ chamber, and a refrigerating room. 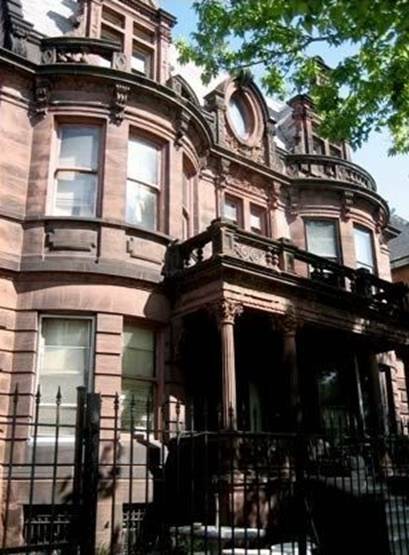 There were six bedrooms, a sunroom, and an elegant terrace porch. 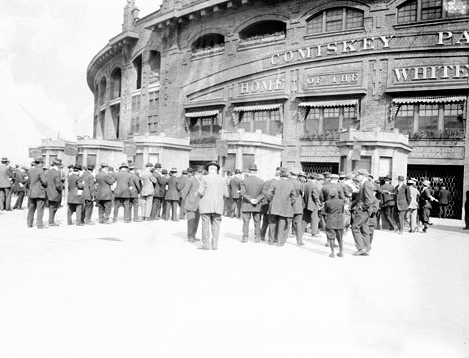 Because of the siting, William Wrigley watch the Cubs practicing from his mansion office. 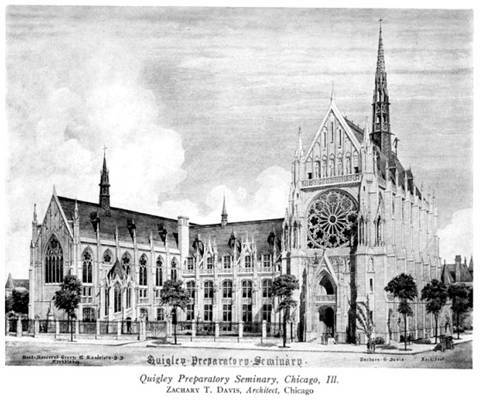 In December of 1922, Father Elieas Magennis, General of the Carmelite Order, and Archbishop Mundelein of Chicago agreed on the need for the immediate construction of a new St. Cyril High School Building. 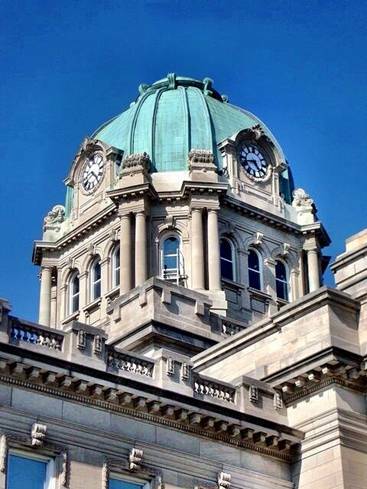 In the spring and summer of 1924, the main high school building was erected, with Zachary Taylor Davis as architect. In November of that year the school was dedicated as Mount Carmel High School. 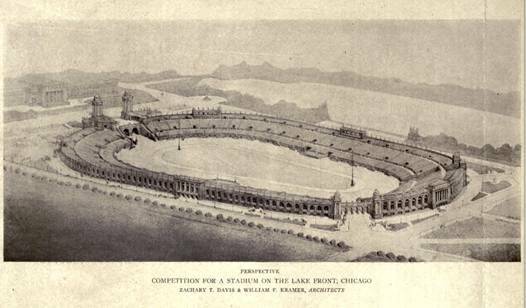 In 1920, several Chicago architects were invited to compete in a competition to design a lake front stadium in honor of WWI veterans. This is the plan submitted by Zachary Taylor Davis and William F. Kramer. 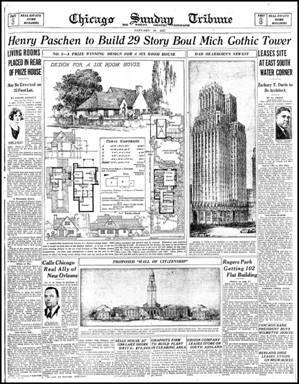 In 1926, the Chicago Daily Tribune published a piece announcing the city’s soon-to-be first co-op office building. Instead, two years later the Burnham Bros. Engineering Building at 205 W. Wacker, rose instead. 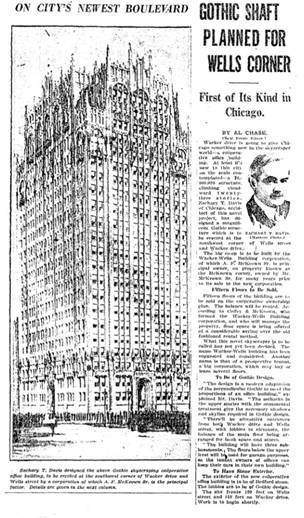 In 1927, developer Henry Paschen leased the site at the southwest corner of Michigan Avenue and East South Water Street for ninety-five years. 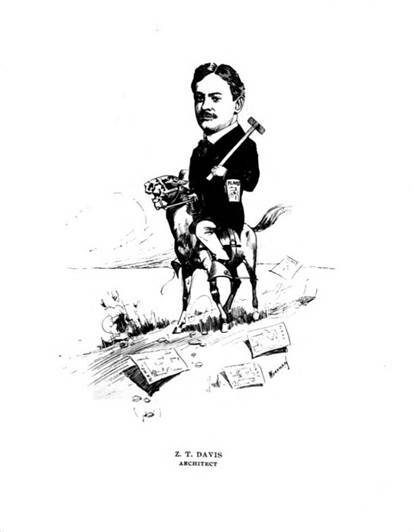 Zachary Taylor Davis designed a twenty-nine story Gothic skyscraper to be constructed at that location. 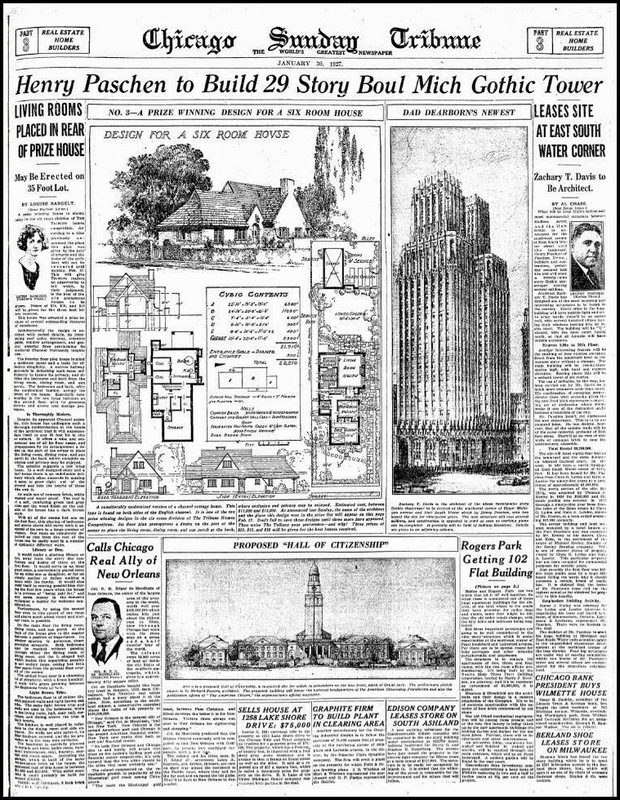 One year later Paschen sold the leases, and in 1928 the Carbide and Carbon building (designed by Burnham Bros.) was constructed. 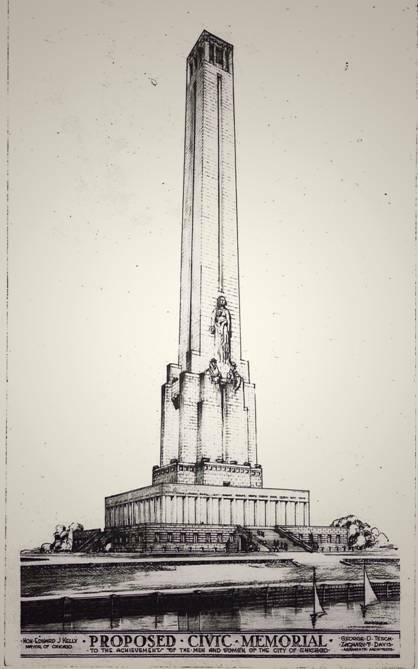 In July of 1927, the Chicago Daily Tribune announced that Zachary T. Davis had designed this handsome structure which Chicago Greeks planned to erect on the Gold Coast. 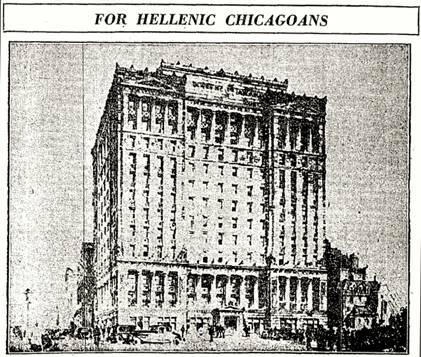 It was to be called the Hellenic-American Club and the cost was $1,250,000. 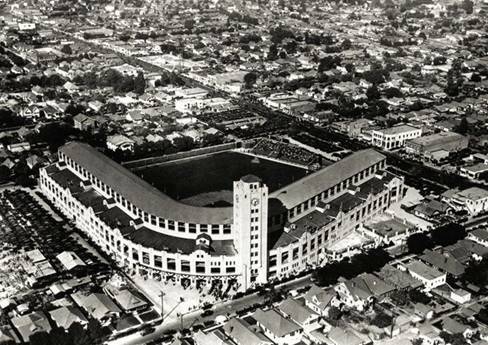 This project originated in the first elective term (1935-1939) of Mayor Edward J. Kelly. Kelly came to office from a long career with Chicago’s South Parks Commission and Board (of which he was President). He played a powerful part in the construction of major projects on the lakefront – such as Soldier Field, the Adler Planetarium, and the Shedd Aquarium. The Civic Memorial was never built, due in large part to the Great Depression. 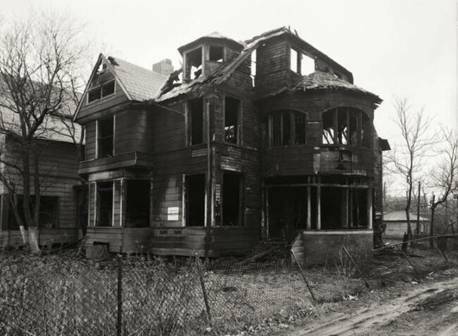 During the 1950s and 1960s, a migration by homeowners to the suburbs and urban renewal programs destroyed countless historic areas across the country, including Chicago’s Kenwood neighborhood. This is Zachary’s home 934 East 45th Street in January of 1965. Almost twenty years had passed since his death, and the house was torn down not long after this photo was taken. 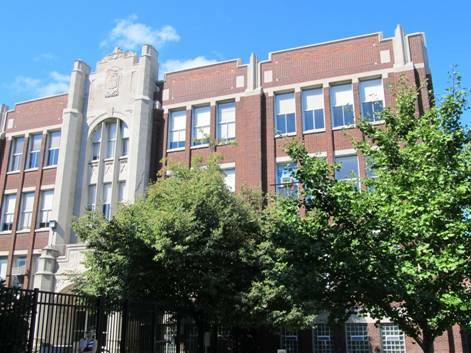 This address is now the site of Dr. Martin Luther King Junior College Preparatory High School, a 4-year selective enrollment magnet high school.